You might think any ironing board will do. There are actually more than a few differences between the best ones (including the price!). To help, we have reviewed the top 5 ironing boards on the UK market in 2019. We're sure you'll find the perfect companion for your iron and laundry! W​hich Size Do I Need? ​The size you need might well depend on the space you have available and the type of garments you typically iron. For example, if you'd like to press your king-size duvet covers then you'd need size "C" and above. Personally, I like the extra space as I'm terrible at neatly positioning collars and cuff to get them pristine! What features does a good ironing board need? You might think they're all the same, but there are some subtle differences you need to look out for. Size – watch out for smaller sized boards, as it is not always obvious that you are looking at one! An extra wide ironing board can also make things a lot easier. There is quite a difference between the "Standard" and the ‘B’ size so check the size carefully. Surface – a good, safe, heat resistant surface is an essential part of any ironing board. The board should also allow good coverage of sleeves, cuffs and collars and a stable resting place for larger irons like Steam Generators. Height – ironing is a physical activity so the best ironing boards are adjustable for any height. Some models have wheels and this can make things easier. Covers - Many people like to stick to the well-known brands because they know that replacement board covers are easy to buy. ​This board is from Russell Hobbs and is fully collapsible,​ made from quality metal, and is the standard (134x45cm) size. ​​It comes with a cleverly designed iron rest – the bit at the end where you put the iron when it’s not being used – made from silicon to withstand the heat and with raised edges so as to prevent the iron falling. This can also be slid away under the board when it is not needed, a nice touch of detail. ​This board weighs around 7.5kg so, while not the lightest, is suitably easy to move around. ​It has a pair of wheels which makes it easier to be moved around and positioned. This makes it a great choice for elderly relative. There is also a rack underneath the board for steam generator irons. All in all this is a quality ironing board from a quality brand. ​​If you're looking for a​ board that is not too big or not too small​, this Brabantia Size B (124cm by 34cm) is ideal. What we love the most about these Brabantia boards is you get loads of options. We've chosen to look at the middle-size, but they have "Size A" (110cm by 30cm) and "Size C" (125cm by 45cm). You also have a choice of 9 different boards from "ice water" to "moving circles". These Brabantia boards are nicely made and fold down to a very slim package for storage. We also like the fact that these come with locks for transport. This stops it from opening (and causing mischief) when you're carrying it and makes it safer to be around children. It has a simple yet effective rest for the iron, and the height is adjustable which is a another big plus. Brabantia really stand behind their products (no pun intended!) and provide a 10-year guarantee with their products. With a range of sizes to suit different homes and styles, it easy to see why they are one of the leading brands in this market. This is an ideal design if you're looking for an ironing board for a small space. ​As you can see from the pictures, the board (Size A - 117cm by 34cm) sits on top of three storage drawers and folds up when no in use, transforming into a novel piece of furniture. It’s a clever design that makes use of available space, but what it does mean is that you have a permanent item of furniture on show at all times. However, it’s well-made and has 3 pull-out drawers and a top shelf, which you can use to store your laundry or iron. This one is made from classy-looking wood and comes ready-assembled for immediate use. I​t would make a great choice for someone in a bedsit or smaller home who needs to use space as best they can. ​If you're after a "Super Size" ironing board that can handle King-Size duvet covers, this one from Addis is it! ​It measures 135 cm by 46cm, so ​really this is 1cm wider than the biggest "Size D". It might not seem a lot, but you can usually expect to pay a lot more for the bigger sizes, such as this model from Brabantia. As well as having extra ironing space, this board comes with ten adjustable heights. This really helps make things really comfortable and your partner (or children) have no excuse for not pitching in! At around 6kg this one does have a bit of weight to it, but many users find it strong and sturdy. There are also wheels on the bottom so you can move it into place easily. A safety catch keeps also prevents it from popping open when you're moving or storing it. At the end of the ironing surface there is a heat resistant area where you can leave your iron face down for a while. Whilst I would prefer it to be metal, this is still an acceptable alternative. 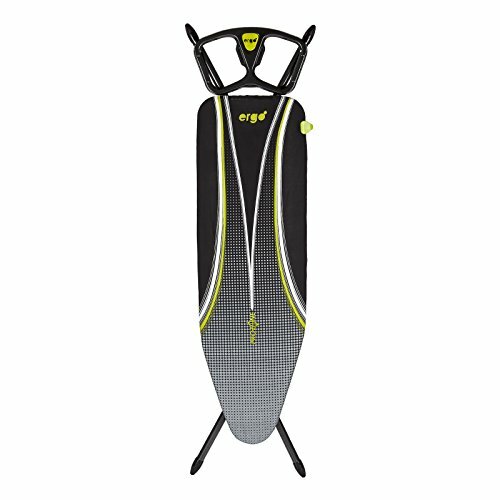 If you're looking for an extra-large ironing board and don't want to break the bank, this is a well-made board available at a great price. The Minky Ergo is an ironing board which has had a lot of innovative features. The "Prozone" cover might sound like something you'd see on Sky Sports, but it's really rather clever. It is made from 100% with a deep felt underlay to give it a firm yet padded feeling. It's also perforated, and this is a great feature for when you're using a lot of steam. ​You can also use this one if you right or left-handed due to the "Ergo Rest". ​This is at the wide end where you rest the iron (as shown on the left) and you can see it's divided in half to suit either side. ​Another great thing with this one is there aren't preset heights. You can fix it anywhere up to 92cm tall. There's also a "Flex Guide" ​(essentially a large peg!) which prevents the cord from getting tangled - something I particularly hate. ​To seal the deal, Minky provide a 5-year ​guarantee and replacement covers are available pretty cheaply. ​It's made in the UK, too. You need to know if you're looking for a steam generator ironing board, the "Ergo Plus" (and not the "Ergo") is the one for you as it has a metal frame for the larger iron. When putting this list together, we tried to find a selection for everybody. If we had to choose which of the five we liked the best, it'd have to be the Minky Ergo. The modern design might not be for everybody, but we love the thought that's gone into it, the 5-year guarantee, and the fact it was made in the UK. The replacement covers are also relatively cheap and the Ergo Plus can accommodate a steam generator iron, too.